We’d love your help. 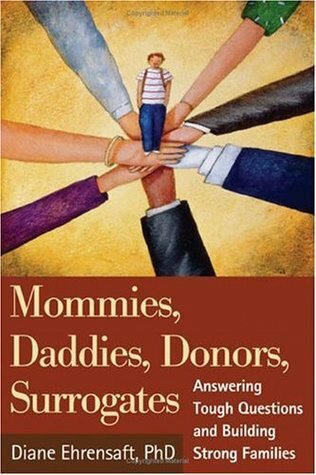 Let us know what’s wrong with this preview of Mommies, Daddies, Donors, Surrogates by Diane Ehrensaft. To ask other readers questions about Mommies, Daddies, Donors, Surrogates, please sign up. If you need help having a baby, reproductive technology can supply the answer. But it also raises a host of questions that won’t arise until after the child is born: What will you say to “Where did I come from?” when the answer includes a donor or surrogate? Will knowing the truth about how you conceived make your child love you less? Will having a baby with someone else strain your relationship with your spouse or partner? What will grandparents, family members, friends, and coworkers think? This book gave some really concrete real life examples of how to deal with this topic when talking with your child. I found it quite helpful and realistic. The author was very clear in stating the research that hasn't been conducted or gathered based on the age of the technology and choices people have made. Great book and Dr. Ehrensaft is brilliant. But it made me wish there was more research and study out there on LGBT parenting specifically.